On 6 April 2009 an Mw = 6.3, Imax = 9–10 earthquake struck the Abruzzi region of Central Italy (http://portale.ingv.it/highlights/view?set_language=en). We find similarities in some peculiar characteristics of the 2009 sequence and some historical events that occurred in the area, in particular in 1461 and 1762. We observed strong analogies in the distribution of the intensities and in the areas of the strongest effects produced by these shocks, as well as in the temporal evolution of the events. The 2009 quake severely devastated the town of L’Aquila (~ 73,000 inhabitants) and tens of villages located in the middle Aterno Valley (hereinafter MAV, see Figure 1). One month after the event, its social impact was not yet fully known but was certainly burdensome: 308 casualties, 47% of homes damaged in the epicentral area, 20% of those were heavily damaged (with an even worse situation in downtown L’Aquila), and about 40,000 people left homeless. 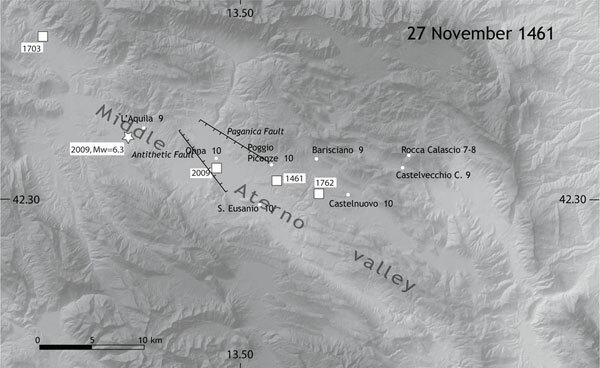 Although the magnitude of the event was not among the largest to have occurred in the Apennines, the Abruzzi earthquake can be considered one of the most disastrous of the last century. The effects of the shaking were recorded not only in the epicentral zone but also in distant areas (e.g., as far as Rome, some 90 km from the epicenter, where it produced light damage) and heavily affected the cultural and socio-economic fabric of a wide region characterized by high seismic risk. ▲ Figure 1. General sketch of the study area. Historical seismicity (squares) is from the Catalogo Parametrico dei Terremoti Italiani (CPTI Working Group 2004). A simplified tectonic framework is shown. The white rectangle indicates the study area depicted in the following figures. Digital elevation model from Tarquini et al. (2007). The present tectonic regime of the Abruzzi sector of the Apennines is characterized by Quaternary normal faults striking NW-SE or N-S. During the evolution of the chain, the activity of the main normal faults led to the formation of intermontane extensional basins filled with Pliocene- Quaternary deposits (Carraro and Giardino 1992; Calamita and Pizzi 1994). These faults are responsible for some of the strongest earthquakes that have occurred in peninsular Italy in the last few centuries (Barchi et al. 2000; Galadini and Galli 2000; Valensise and Pantosti 2001). Just northeast of the MAV, the Gran Sasso area is bordered by a set of normal structures that were investigated by paleoseismological analyses (Giraudi and Frezzotti 1995; Galadini et al. 2003). Galadini et al. found evidence of Holocene activation related to strong earthquakes along the “silent” Campo Imperatore fault (CIF in Figure 1), though no historical event can be associated with this structure. Focusing on the region closer to the town of L’Aquila, systems of NW-striking en-echelon normal faults originated a series of NW-SE elongated depressions with evidence of Quaternary activity (Bertini and Bosi 1993; Calamita et al. 2000). There is evidence of large-magnitude seismicity affecting the central Apennines in the historical records; in particular, the available catalogs (e.g., CPTI Working Group 2004) report the 1349, 1703, 1706, and 1915 events (all with M > 6.5 and I > 10) as the strongest earthquakes in this area (Figure 1). In the L’Aquila area the strong (XI MCS) 1703 event has been related to the upper Aterno Valley fault system (Cello et al. 1998; Moro et al. 2002; Galli et al. 2008). It is important to point out that the seismicity of the MAV is less frequent and energetic than in the surrounding areas, except for the strong 1461 earthquake (X MCS, MwM 6.4, CPTI Working Group 2004), which occurred very close to L’Aquila. The remaining historical seismicity is associated with low-magnitude events, most of which occurred after the 18th century (see Figure 1). These earthquakes, defined as “L’Aquila events” due to the cultural and administrative control exerted by the town, are poorly located because of the paucity of sources. The low rate of seismicity in this area is confirmed by the analysis of the instrumental seismicity, as M > 3.5 events during the period 1983–2007 (Castello et al. 2006) are sparse and rather infrequent. ▲ Figure 2. Maximum intensities (MCS) map of the 2009 earthquake. White squares indicate macroseismic epicenters of the four earthquakes cited in the paper; white star indicates the instrumental location of the 6 April 2009 event. Black lines indicate the Paganica fault responsible for the 2009 quake and an antithetic fault. The 6 April 2009 mainshock was the peak of a four-month sequence that progressively aroused alarm in the population, especially after an ML = 4.1 foreshock occurred on 30 March 2009. Two ML 5+ and 13 ML 4+ events occurred in the two weeks following the mainshock, and a total of more than 30,000 seismic events was recorded during the sequence. The macroseismic survey of the 6 April 2009 event (Galli and Camassi 2009) shows that the largest damage is mainly distributed in a NW-SE oriented direction (Figure 2). The maximum assessed intensity is 9–10 MCS in the localities of Onna and Castelnuovo, where a large amount of destruction occurred. Sixteen localities suffered intensity larger than 8 MCS. In general, a notable component of seismic vulnerability was observed in the historical city centers due to the widespread presence of old and badly maintained dwellings built of fieldstone. This type of construction suffered the greatest damage from the earthquake. In general, the newer part of the towns, developed during the last few decades with the addition of reinforced concrete and good masonry buildings, suffered only slight to moderate damage. Reinforced concrete buildings totally collapsed or were heavily damaged in only a few cases, in particular within the city of L’Aquila. Figure 2 shows that the largest intensities are noticeably located southeast of the instrumental epicenter (Istituto Nazionale di Geofisica e Vulcanologia; http://portale.ingv.it/primo-piano-1/news-archive/2009-news/april-6-earthquake/location-of-april-the-6th-2009-earthquake-updated-with-all-the-available-data/view?set_language=en). This can be interpreted as a directivity effect confirmed by ground-motion evidence (Cirella et al. forthcoming). A local component of damage is possibly due to the presence of site effects, especially along the Aterno Valley, where some villages are built on soft alluvial recent deposits. ▲ Figure 3. Maximum intensities (MCS) map of the 1762 earthquake. 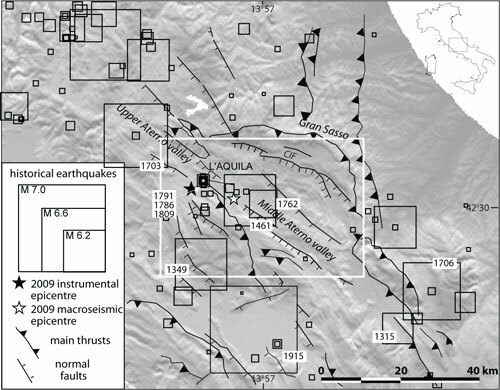 White squares indicate macroseismic epicenters of the four earthquakes cited in the paper; white star indicates the instrumental location of the 6 April 2009 event. Black lines indicate the Paganica fault responsible for the 2009 quake and an antithetic fault. Moving backward in time the most important earthquakes to have occurred in the L’Aquila area were the 1762 and the 1461 events. The 6 October 1762 event caused serious damage in some localities of the MAV, all located southeast of L’Aquila (Figure 3). The highest intensities are reported at Castelnuovo (9–10 MCS), Poggio Picenze (9), Barisciano (8), and L’Aquila (7). This event was also felt in Rome (3) almost 100 km away from the epicenter. Though the number of known localities struck by the earthquake is limited, the description of the effects is well documented by historical sources and archival records owned by the National Archive of L’Aquila (Guidoboni et al. 2007; Giannangeli 1974; Rossi et al. 2005). ▲ Figure 4. Maximum intensities (MCS) map of the 1461 earthquake. White squares indicate macroseismic epicenters of the four earthquakes cited in the paper; white star indicates the instrumental location of the 6 April 2009 event. Black lines indicate the Paganica fault responsible for the 2009 quake and an antithetic fault. The strongest earthquake we can locate in the MAV is the 27 November 1461 event (Figure 4). The main historical accounts are from coeval sources, transcribed by Antinori (Antinori, n.d.; Casti 1887). Such chronicles report in detail the damage suffered by the city of L’Aquila, especially to its monumental buildings. Less detailed accounts are available for the villages surrounding L’Aquila. The intensity map consists of seven localities, including L’Aquila, for which an accurate description of the damage and an estimate of the casualties are available. In addition, the coeval sources report accounts of severe damage in the villages of Onna, Poggio Picenze, Castelnuovo, S. Eusanio, Barisciano, and Castelvecchio Calvisio, all located southeast of L’Aquila in the MAV (Giannangeli 1974; Rossi et al. 2005). No information is available concerning the damage in other sites, except for a single uncertain report of collapses in Rocca Calascio, which has been assigned a tentative intensity of 7–8. The two mainshocks of 27 November were followed by a two-month seismic sequence characterized by a great number of events. Strong aftershocks occurred on 4 December, 17 December, and 4 January 1462, and these aftershocks subsequent to 27 November noticeably worsened the damage. Similar to most historical events worldwide from this time period, the original sources for this earthquake are very few. Those sources form the basis of most later reports, which usually carry less significant information than the original sources. Moreover, in the case of the 1461 event, the available sources are mainly related to one locality, probably because of a combination of historical epoch and the event location (Castelli and Camassi 2000). Indeed the earthquake occurred very far from the most important regional administrative center (Naples), but very close to L’Aquila, a place subordinate in rank. As a consequence, information about earthquake effects in the more secluded districts, or up in the mountains, drew little or no attention because these took place far from the only administrative town in the region. These circumstances lead us to maintain that the 1461 event is certainly underestimated in the extent of the area affected by the shock and therefore could be very similar in size to the area damaged in the 2009 earthquake (Figure 2). ▲ Figure 5. Map of the intensities (MCS) of the 1703 earthquake within the study area. 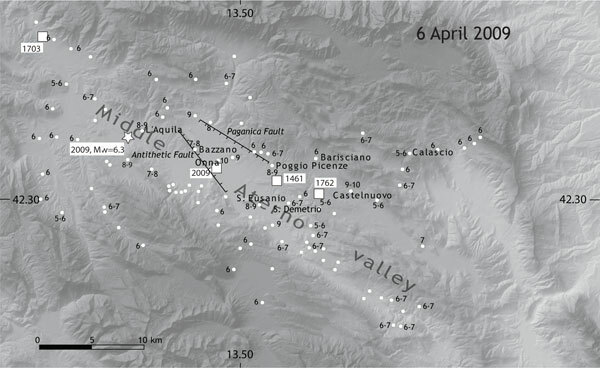 White squares indicate macroseismic epicenters of the four earthquakes cited in the paper; white star indicates the instrumental location of the 6 April 2009 event. Black lines indicate the Paganica fault responsible for the 2009 quake and an antithetic fault. The seismic hazard associated with the L’Aquila region is based on a seismicity with rates of occurrence of 250–300 years for the highest intensities (MPS Working Group 2004; CPTI Working Group 2004; Rossi et al. 2005). However, prior to the occurrence of the 2009 earthquake, the strongest events were rather old and not fully documented, and the knowledge of their influence on the territory was still to be thoroughly understood. In a previous study on the seismicity of this region (Rossi et al. 2005) it was mentioned that the 1461 and 1762 events probably centered on the same area, the MAV. However, the historical sources did not allow Rossi et al. (2005) to provide sufficient constraints to the location and size of these earthquakes. The occurrence of the 2009 earthquake may represent the key to comprehending the seismicity of the area and may provide clues to interpreting past earthquakes. A comparison between the 1461 and 1762 seismic events on the one hand and the 2009 earthquake on the other hand provides a number of interesting points to discuss. A first general observation deriving from the occurrence of the recent event is that the traditional housing (mostly dating back to the 18th–19th centuries) of each village suffered the heaviest damage. This evidence indicates that for this kind of building stock, no substantial improvement in vulnerability has been achieved in the last decades. Also evident is the similarity in the distribution of the highest intensities among these events, as the most damaged localities recur in each of the three quakes and, in general, the areas of the strongest effects coincide: southeastward of the instrumental location of 6 April 2009 and along the MAV (Figures 2–5). One wonders if this coincidence is due to site effects or source effects. To solve this question we can compare the intensity distribution of the 1461, 1762, and 2009 MAV events with that of the 1703 earthquake (Figure 5). The latter is the closest and strongest event outside of the study area and is associated with a seismogenic structure located in the upper Aterno Valley (Cello et al. 1998; Moro et al. 2002; Galli et al. 2008) ~ 20 km north of the 2009 instrumental epicenter. The distribution of highest intensities of the 1703 earthquake is shifted northwestward and is different from the other events, with the exception of the village of Castelnuovo, for which a maximum intensity value recurs for all the considered events. On one hand this fact confirms the contribution of site effects at Castelnuovo, on the other hand it suggests that the intensities at the other localities observed after the 1461, 1762, and 2009 events are mainly due to source effects. We note that, based on historical analysis and comparison of the intensity maps, the area affected by severe damage of the two historical events could be wider than previously established (see also Rossi et al. 2005) and remarkably similar in extension and pattern to the modern one. The temporal patterns of the 1461 and 2009 sequences also show remarkable similarities. Indeed, the two mainshocks were preceded by significant foreshocks that occurred seven to 10 days before the mainshocks. Moreover, both mainshocks were shortly followed (one–two hours) by a high-energy aftershock, and the rest of the sequence evolved for about two months with several M 4+ events. In the sources of the 1461 earthquake we can deduce this feature from the description of the effects of those shocks (very strong shaking, further falling of buildings or of parts of buildings, etc.). The above-described characteristics of the distribution of the maximum intensities and of the temporal pattern of the sequences lead us to consider the 1461 and 1762 seismic events as predecessors of the modern one. The most straightforward consequence of this assertion is that both the historical and the 2009 earthquakes are due to the activity of the same seismogenic source, the Paganica fault (see Figures 2–5) (Atzori et al. 2009; Chiarabba et al. 2009; Emergeo Working Group forthcoming), which before the modern event had an almost unknown seismogenic role. However, in the case of the L’Aquila earthquakes, we observe that the ~ three-centuries recurrence time of the events would be a too-short rate when compared to the mean recurrence times calculated for any other seismogenic faults in peninsular Italy (Galli et al. 2008), even for moderatemagnitude events. Thus, a less straightforward but still conceivable consequence of our observations is that a not negligible component of the seismic hazard in the L’Aquila area can be provided by some structures antithetical to the 2009 fault (Figures 2–5). Along such antithetical sources there is evidence for individual events of Holocene surface faulting (Emergeo Working Group forthcoming), which should produce a distribution of intensities similar to that of the modern earthquake. Therefore, we hypothesize that the same seismogenic volume—but not necessarily the same seismogenic source—is involved in the occurrence of the strongest events in the MAV. Crossing historical, geological, and paleoseismological analyses altogether will provide a fundamental contribution to a full understanding of the seismic history and of the role of the seismogenic faults of this region. Antinori, A. L. (n.d.). Annali degli Abruzzi, vol. 15, manuscript in Municipal Library “S. Tommasi,” L’Aquila, Italy. Atzori, S., I. Hunstad, M. Chini, S. Salvi, C. Tolomei, C. Bignami, S. Stramondo, E. Trasatti, A. Antonioli, and E. Boschi (2009). Finite fault inversion of DInSAR coseismic displacement of the 2009 L’Aquila earthquake (central Italy). Geophysical Research Letters; doi:10.1029/2009GL039293. Barchi, M., F. Galadini, G. Lavecchia, P. Messina, A. M. Michetti, L. Peruzza, A. Pizzi, E. Tondi, and E. Vittori, eds. (2000). Sintesi delle conoscenze sulle faglie attive in Italia Centrale: Parametrizzazione ai fini della caratterizzazione della pericolosit. sismica. Rome: Consiglio Nazionale delle Ricerche/Gruppo Nazionale per la Difesa dai Terremoti, 62 pps. Bertini, T., and C. Bosi (1993). La tettonica quaternaria della conca di Fossa (L’Aquila). Il Quaternario 6, 293–314. Calamita, F., and A. Pizzi (1994). Recent and active extensional tectonics in the southern Umbro-Marchean Apennines (central Italy). Memorie della Societ. Geologia Italiana, 48, 541–548. Calamita, F., A. Pizzi, V. Scisciani, C. De Girolamo, M. Coltorti, M. Pieruccini, and E. Turco (2000). Caratterizzazione delle faglie quaternarie nella dorsale appenninica umbro-marchigiano-abruzzese. In Le ricerche del GNDT nel campo della pericolosit. sismica (1996–1999), ed. F. Galadini, C. Meletti, and A. Rebez, 157–169. Rome: Consiglio Nazionale delle Ricerche/Gruppo Nazionale per la Difesa dai Terremoti. Carraro, F., and M. Giardino (1992). Geological evidence of recent fault evolution: Examples from Campo Imperatore (L’Aquila–central Apennines). Il Quaternario 5, 181–200. Castelli, V., and R. Camassi (2000). Per un’analisi di completezza del catalogo: spunti e case histories. In Le ricerche del GNDT nel campo della pericolosit. sismica (1996–1999), ed. F. Galadini, C. Meletti, and A. Rebez, 321–331. Rome: Consiglio Nazionale delle Ricerche/ Gruppo Nazionale per la Difesa dai Terremoti. Castello, B., G. Selvaggi, C. Chiarabba, and A. Amato (2006). CSI catalogo della sismicit. italiana 1981–2002. Version 1.1. Rome: Istituto Nazionale di Geofisica e Vulcanologia/Centro Nazionale Terremoti; http://www.ingv.it/CSI/. Casti, E. (1887). Anton Ludovico Antinori e le sue molteplici opere edite ed inedite. L’Aquila: Tip. Grossi. Cello, G., S. Mazzoli, and E. Tondi (1998). The crustal fault structure responsible for the 1703 earthquake sequence of central Italy. Journal of Geodynamics 26, 443–460. Chiarabba, C., A. Amato, M. Anselmi, P. Baccheschi, I. Bianche, M. Cattaneo, G. Cecere, L. Chiaraluce, M. G. Ciaccio, P. De Gori, G. De Luca, M. Di Bona, R. Di Stefano, L. Faenza, A. Govoni, L. Improta, F. P. Lucente, A. Marchetti, L. Margheriti, F. Mele, A. Michelini, G. Monachesi, M. Moretti, M. Pastori, N. Piana Agostinetti, D. Piccinini, P. Roselli, D. Seccia, and L. Valoroso (2009). The 2009 L’Aquila (central Italy) MW 6.3 earthquake: Main shock and aftershocks, Geophysical Research Letters, doi:10.1029/2009GL039795. Cirella, A., A. Piatanesi, M. Cocco, E. Tinti, L. Scognamiglio, A. Michelini, A. Lomax, and E. Boschi (2009). Rupture history of the 2009 L’Aquila earthquake from non-linear joint inversion of strong motion and GPS data. Geophysical Research Letters 36, L19304, doi:10.1029/2009GL039795. CPTI Working Group (2004). Catalogo Parametrico dei Terremoti Italiani, versione 2004 (CPTI04). Bologna: Istituto Nazionale di Geofisica e Vulcanologia; http://emidius.mi.ingv.it/CPTI04/. Emergeo Working Group (forthcoming). Geological coseismic effects of the 2009 L’Aquila seismic sequence (central Italy). Terra Nova. Galadini, F., and P. Galli (2000). Active tectonics in the Central Apennines (Italy): Input data for seismic hazard assessment. Natural Hazards 22, 225–270. Galadini, F., P. Galli and M. Moro (2003). Paleoseismology of silent faults in the Central Apennines (Italy): The Campo Imperatore fault (Gran Sasso range fault system). Annals of Geophysics 46, 793–814. Galli, P., F. Galadini, and D. Pantosti (2008). Twenty years of paleoseismology in Italy. Earth-Science Reviews 88, 89–117. Galli, P., and R. Camassi, eds. (2009). Rapporto sugli effetti del terremoto aquilano del 6 aprile 2009; Dipartimento della Protezione Civile Istituto Nazionale di Geofisica e Vulcanologia QUEST Team, http://www.mi.ingv.it/eq/090406/quest.html. Giannangeli, R. (1974). Terra di Barisciano. L’Aquila: Japadre. Giraudi, C., and M. Frezzotti (1995). Paleosismicity in the Gran Sasso massif (Abruzzi, Central Italy). Quaternary International 25, 81–93. Guidoboni, E., G. Ferrari, D. Mariotti, A. Comastri, G. Tarabusi, and G. Valensise (2007). CFTI4Med, Catalogue of Strong Earthquakes in Italy (461 B.C.–1997) and Mediterranean Area (760 B.C.–1500); http://storing.ingv.it/cfti4med/. Moro, M., V. Bosi, F. Galadini, P. Galli, B. Giaccio, P. Messina, and A. Sposato (2002). Analisi paleosismologiche lungo la faglia del M. Marine (Alta Valle dell’Aterno): Risultati preliminari. Il Quaternario 15, 259–270. MPS Working Group (2004). Redazione della mappa di pericolosit. sismica prevista dall’Ordinanza PCM del 20 marzo 2003. Rapporto Conclusivo per il Dipartimento della Protezione Civile. Milan and Rome: Istituto Nazionale di Geofisica e Vulcanologia, April 2004, 65 pps. Rossi, A., A. Tertulliani, and M. Vecchi (2005). Studio macrosismico del terremoto dell’Aquilano del 24 giugno 1958. Il Quaternario 18 (2), 101–112. Tarquini, S., I. Isola, M. Favalli, F. Mazzarini, M. Bisson, M. T. Pareschi, and E. Boschi (2007). TINITALY/01: A new triangular irregular network of Italy. Annals of Geophysics 50 (3), 407–425. Valensise, G., and D. Pantosti (2001). Database of potential sources for earthquakes larger than M 5.5 in Italy. Annals of Geophysics 44 supp., 180 pps., with CD-ROM.